Last modified on 2013-11-19 07:53:03 GMT. 0 comments. Top. It is the 1920s, a time of much industrial building and growth. In this board game, you must invest in building factories and businesses, in order to produce goods and sell them to gain victory points. It is a delicate balance of money, production, and goals. The person who can best manage their buildings and meet their goals in 7 turns will win. Each player starts the game with 4 workers and $6000. Every turn, players first buy buildings, then place workers on those buildings or on the board. Factories allow you to produce goods, while Businesses allow you to sell those goods for money or victory points. A good player needs to balance their production and sales, and encourage other players to sell with them to maximize sales. Board elements allow players to take advantage of bonuses, such as extra production, building improvements, and Corporate Strategy cards. Corporate Strategy cards help give players additional goals and direction, by specifying additional ways to gain victory points. At the end of 3 turns, on years 1923, 1925, and 1927, upkeep will be due, and players must pay to maintain their buildings, or will need to take out loans. Players will need to sell enough goods before then to have enough money to cover the costs, as loans are worth negative victory points at the end of the game. After year 1927, whoever has the most victory points from combined sales, buildings, and Corporate Strategy cards wins the game. 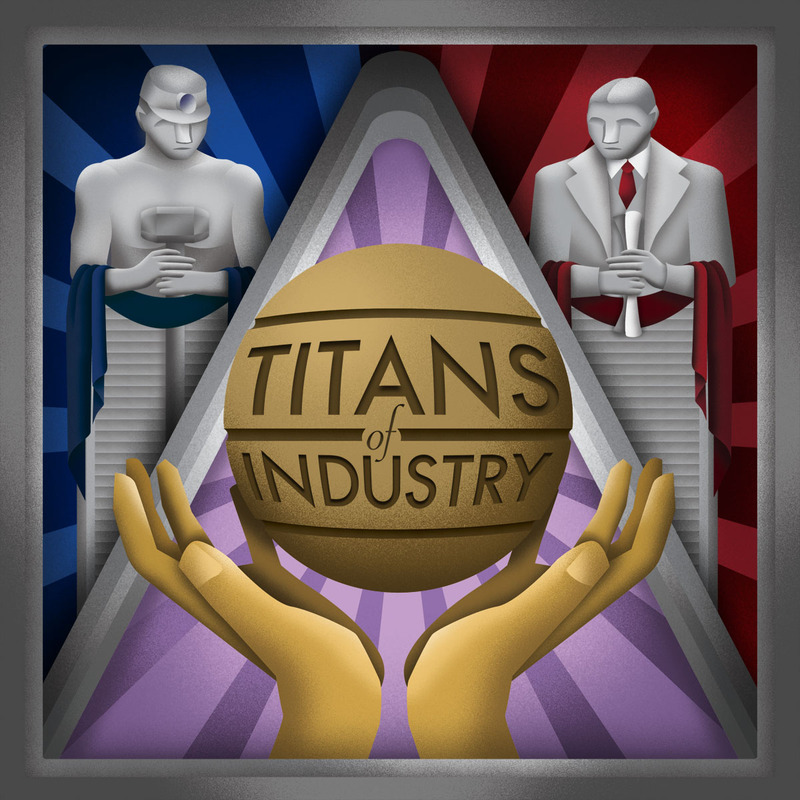 Titans of Industry is a rich worker placement/resource management Euro-style game. It plays 3 to 6 players, and plays approximately 20-25 minutes per player.